I had a great idea from one of our viewers about how to execute the hair loss diet while traveling. I’ve been asked this question before, and this is a great time to go through the list of things to watch out for. The Standard American Diet cannot sustain the hair loss diet. You have to be diligent at every turn when you’re outside your home. Once you reach your destination, you must shop the perimeter of the stores. Even if you have to make several trips to get living foods, it has to be done. The alternative is chicken nuggets, whole wheat buns and sugary foods that will jack your blood sugar sky high. As you already know, it doesn’t take much to reverse the effects of the hair loss diet. 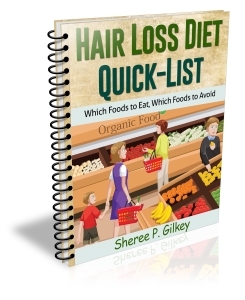 Within a day to a week, if you go off of the diet, you can begin to notice hair loss. This has happened to some of our visitors during their vacations, and we want to do everything in our power to avoid this. This newsletter is going to teach you step by step how to travel while incorporating the hair loss diet. I’ve added personal experiences here to show you how serious it is. The hair loss diet is exactly like being a diabetic without medication. If you have to explain yourself to a staff worker, you can say, “I am on a diabetic diet.” You’ll go a lot further than trying to explain the glycemic index. If you say, “I am on a low glycemic diet,” you will get a blank, confused look. If you say, I am on a “no sugar diet,” they will hand you a box of processed food with no sugar that is outside of our guidelines. You really have to fully understand the science before venturing away from home. It’s hard, but it can absolutely be done. The trick to traveling is avoiding the Standard American Diet. In order to do this, you’re going to have to go against the grain at every step. When everybody is swimming downstream, you will be swimming upstream. This is a lot of work, and you have to do a lot of maneuvering. You will be stunned at the lack of awareness from hotel staff, food service workers, and waiters and waitresses about the issues we face. You’re going to have to bring food when you’re traveling. I anticipated this on our last trip. I packed oranges, apples, bananas, nuts, cans of fish, sardines, cheese and avocados. At the airport, when they tried to check our bags, they informed us that they were too heavy, and they’d be adding hefty fees to compensate for the weight. So I had to go through my bag and take out my oranges and other very heavy items. Luckily, they did not add charges to our carry-on bags, and we still kept our food. We ate on our layover, and then shopped at a store near our destination. Let’s go over the items of food you’re going to take with you. You can take food on boats, trains and airplanes. Look through your refrigerator and cupboards and find the lightest weight items you can that fit the guidelines. This is a short list. You can always look for other items in your home that will work too. Pack one can of sardines for each day you’ll be gone. 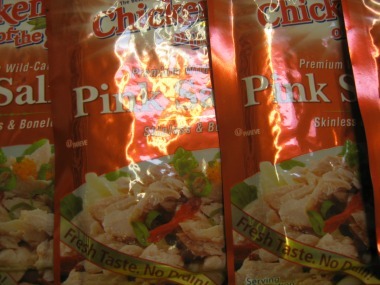 One packet of salmon for each day of your trip. One small avocado for each day you’ll be gone. Five to eight home-made chocolate chip cookies. For the avocados, make sure they’re not overripe so they’ll last the whole trip. The salmon is very light, and will not add weight to your luggage. The string cheese is just for the first day, because they need to be refrigerated. Our chocolate chip cookies are like a meal. They are filled with protein and will stop hunger the same as real food, because they are real food! The tea is very light and would add nothing to the weight of your luggage. Note: You cannot carry water or liquid items as carry-on for airplanes. This is for security purposes. The concept of a low glycemic, whole foods diet is not understood by the mainstream community. If you go to Wolfgang Puck at Seattle airport and ask for a low glycemic dinner plate, they will look at you with dazed confusion. So you will take the concept of whole foods and you apply it to the menu. I want to emphasize that this can be done absolutely anywhere, including fast foods. You will have to be aggressive about asking questions about how the food is prepared, and exactly what’s in it. If you’re ever unsure, apply the #1 hair loss diet rule: When in doubt, leave it out! At Seattle-Tacoma International Airport, we ate at Wolfgang Puck. I ordered a green salad with grilled chicken for $11.99. Whole foods are a lot more expensive. The pizza there was about six bucks, which is half the price. If you are desperate and all they have is pizza, then just eat the cheese with the topping. This is within our guidelines. I’ve done this, and it tastes just as good as eating the whole thing. If you eat the cheese and topping, you’re good for another four to six hours. That’s how filling it is, and you won’t have that panicky hungry feeling. At the airport, there’s a ton of restaurants and stores. Walk into the store or restaurant and ask if they have pre-boiled eggs. Many times they do because boiled eggs are added to salads. And they’ll sell boiled eggs to you for 50 cents to $1. Most stores have bags of nuts, fruit and cheese. Grab as many bottles of water as you can to hold you over. I know these are more like snack foods, but at least you’re not going to be eating the mainstream heavy-duty scary foods that are outside of our guidelines. Most airports have McDonalds. You can use this same whole foods concept at McDonalds. Get the salad with grilled chicken. Order a bottle of water, or get a cup and get free water from the fountain. A salad at McDonalds is between $6 and $7. A cheeseburger is 69 cents. Whole foods are a lot more expensive, and nowhere is this more evident than when you’re traveling. In my experience, the airline will allow you to pack food in your luggage. You can stock healthy food in your suitcase. Please be very careful of the weight if you’re flying. If your suitcase is overweight, they can add an extra charge of $50 to $100, depending on the airline. Also, make sure you have ready access to clean water. Unless you’re flying first class, food is sparse. Before your flight, load up on avocados, nuts, string cheese, packaged salmon, and bring bottled water with you. The second you land or go into your layover, find a restaurant and look for food options that do not contain gluten or sugar. If you ask customer service personnel for low glycemic options, they will have no idea what you’re talking about. So you’re going to look for green salads with protein sources like chicken, fish, cheese or beans. Combine your foods exactly the way you do when you’re at home, and you’re good to go. Hotels should easily be able to accommodate our guidelines. When you’re ordering food, you can get all of the whole foods that are allowable on our diet. Study their menu and don’t be afraid to ask questions. Amtrak allows food to be brought on trains for any reason, and there’s no limit to how much you can bring. Take coolers, and pack as much food as you want for your trip. This is a great option for those of you who do not like to fly. Once you get to your destination, stop everything, go to the store and buy whole foods. You may be up late cooking for yourself. Cook extra food for the next day and store it. You may have to call ahead to see if the hotel you’re staying at has a refrigerator. Our hospitals may be most dangerous places of all. When my daughter was hospitalized through a misdiagnosis made by the E.R. doctor, I got a shocking jolt. They served her white toast, white flour pancakes with syrup, orange juice, apple juice and cereal. This meal was between 90 to 95 on the glycemic index. When I looked at her breakfast plate, I realized that I couldn’t eat one single item. Our hospitals are obviously unaware that they are contributing to the obesity and diabetes epidemic. Pre-plan and ask your nurse for a diabetic plate to avoid this. You’ll have to ask your doctor for a prescription to get a special meal plan using the guidelines of The American Dietetic Association. The foods they will send you are based on carb counting, and they do not take the glycemic index into consideration. So either ask for a whole foods plate, or select the whole foods off the plate they give you, and you should be fine. I hope this information gives you some idea of how serious it is to stick to the guidelines, and how to eat while traveling. As you can see, it’s not easy, but it’s so worth it. I know it’s nerve-racking, but there are so many unbelievable benefits to eating this way. And you’ll be getting a luxurious, thick, gorgeous head of hair. We have a new download for our viewers. It’s called the Hair Loss Diet Quick-List. It features a list of foods to eat and foods to avoid and why. In the meantime, good luck to you. I wish you the best. And remember to sign up for coaching if you ever run into a snare.